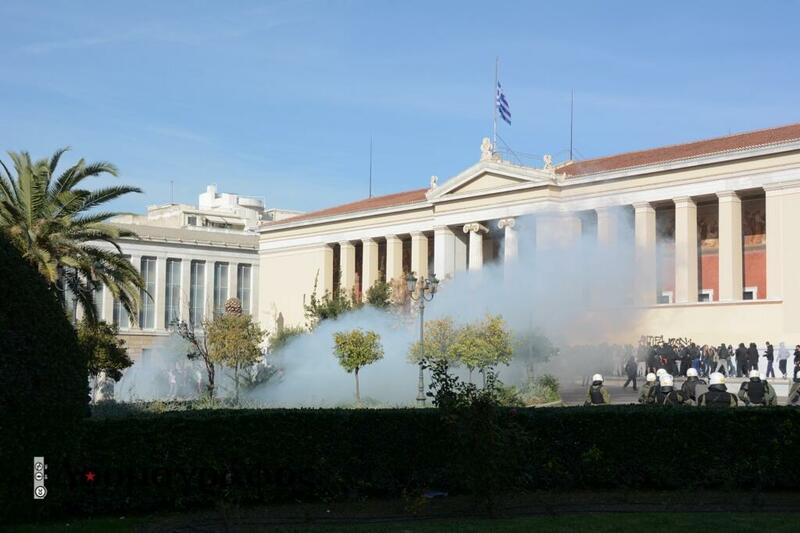 Athens [01:02] Clashes in Exarhia are still going on, there are reports for a “bang” in the lower part of the square. Kavala [00:50] Eighty people demonstrated today in Kavala from the only anti-authoritarian bloc of the city. 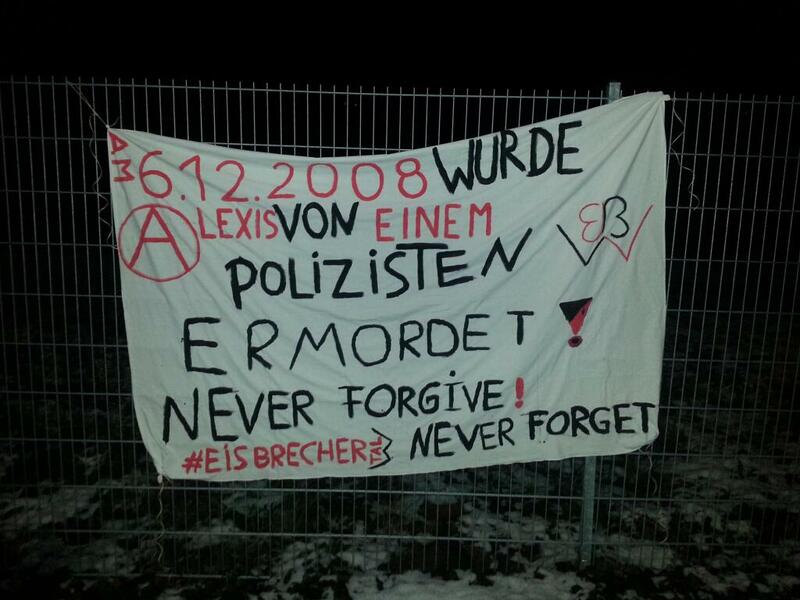 Solidarity texts have been distributed to the hunger striker Spyros Stratoulis. Karditsa [00:40] Two hundred people demonstrated in the city center calling out chants distributing texts and writing slogans with stencil on the walls. Kozani [00:33] A march took place around 7pm with strong pulse at the city center in memory of Alexandros Grigoropoulos. A PA system was used during the march. The demonstrators also had banners and gave out pamphlets. The cops were tantalizingly close to the gathering, and during the march of the 60 people, 2 riot police squads were following them. Athens [00:22] Police entered in the blue residential building in Exarhia and detained people that were trapped inside. They are taking them to the police headquarters (GADA) in Alexandras avenue. The lawyers are already there talking with police. More lawyers are coming. Athens [00:04] Two police cars arrived and loaded two people from the square. Now they are leaving. There is a call for the people that are trapped inside the surrounding buildings to come out. 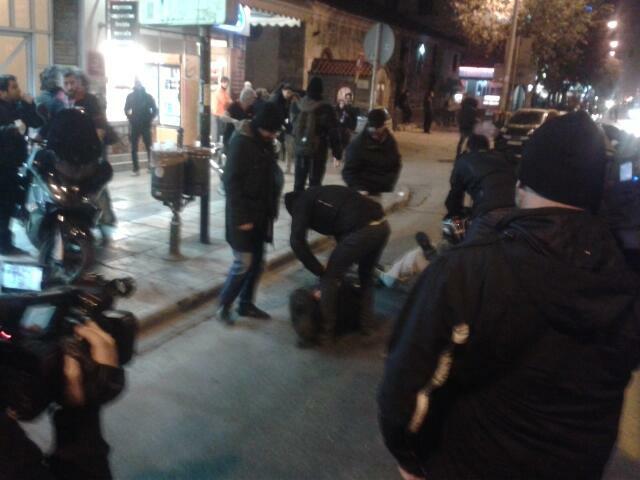 Athens [23:56] Right now a police squad is dragging a person in Arahovis street. Riot police units are leaving from the blocks of flats heading towards Mpenaki street and Strefi hill. Athens [23:50] from phone call: Urgent call for lawyers. 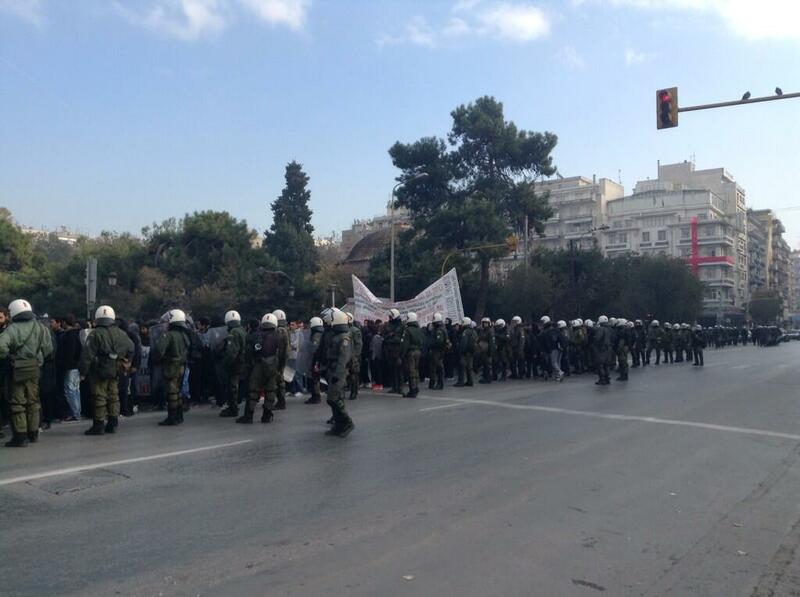 Riot police squads entered Themistokleous and Valtetsiou st. in order to arrest people there. They are preparing to enter the Blue block of flats. Delta units have put bottles (molotov) at the building’s entrance at the corner of Themistokleous and Valtetsiou st. and are photographing the items. Athens [23:42] Riot police squad and Delta police on motorbikes are hidden on the corner of Exarhia Square and Valtetsiou. They are searching the flower beds with torches. 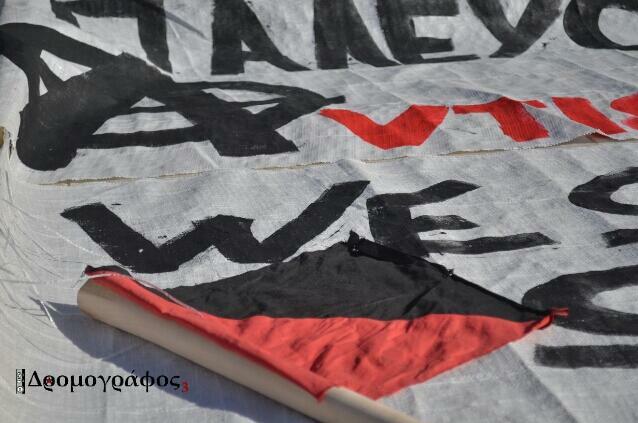 Athens [23:30] There are 136 detentions in total from the afternoon demonstrations. Eighty four of them happened in Exarhia. Seven of those became arrests of which three were in Exarhia. Athens [23:27] As it was mentioned earlier, street lights in the Exarhia area are turned off. Cops are moving around in the alleys with flash lights, looking for people. Athens [23:23] There are reports about 40 people surrounded by riot police as well as police on motorcycles (Delta) in Exarhia square. Athens [23:17] Youngsters in Stournari street are shouting “These days are Alexi’s days”. The cops are throwing chemicals as well as flash grenades in Exarhia square. Approximately fifteen police on motorcycles (Delta) are located in Themistokleous. Riot police are in the square as well as Valtetsiou street. 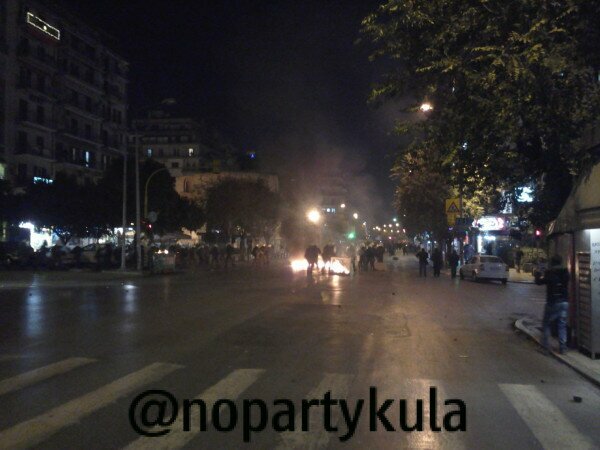 Athens [23:16] Riot police has just been attacked in Eresou and Tositsa street. Agrinio [22:40] Earlier today a group of people attacked banks and Hellenic Postbank in the center of the city with molotov cocktails and stones. 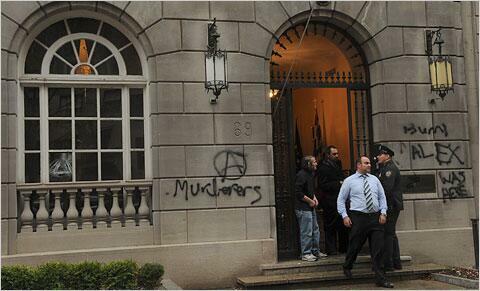 They clashed with the cops which drowned the center of the city with tear gas. 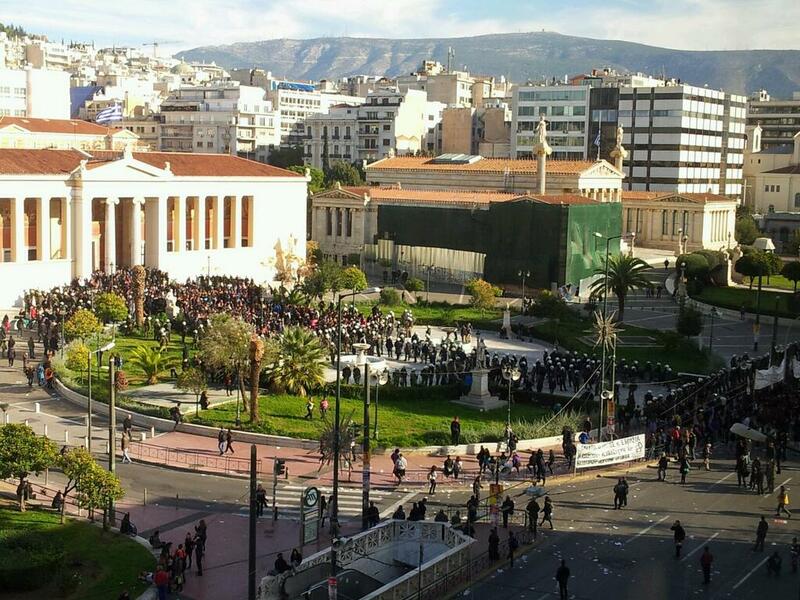 The cops chased a group of approximately 50 people near the municipal park and Panaitolikos’ stadium. There are reports for detentions around the city. Photograph 1, Photograph 2, Photograph 3, Photograph 4. Athens [22:15] According to information from the parents that are standing outside police headquarters (GADA) in Alexandras avenue, their arrested kids have been beaten up by the police. Athens [22:12] Ippokratous street from the side of Alexandras avenue is blocked by police. They are searching everyone that passes by. Athens [22:02] Riot police squads are descending Stournari st. from Exarhia square, while other cops remain to the square. Reports on detentions are still ongoing. 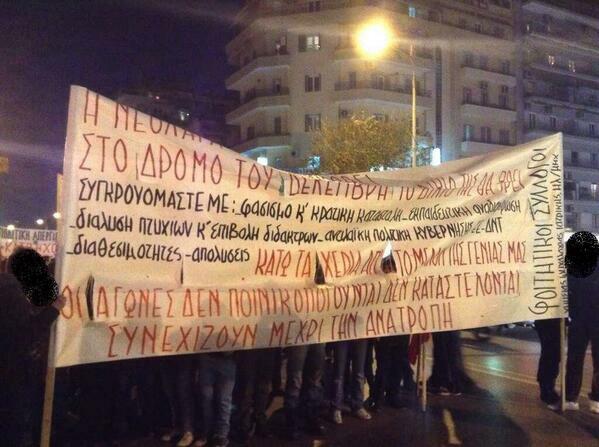 Athens [22:01] The detentions from the demonstration of school students earlier are 27 out of which 10 became arrests. Athens [21:45] The arrested people from Messologiou street are being taken to the police headquarters (GADA) in Alexandras avenue. Around fifty to a hundred people so far including parents of the student detainees have gathered outside the building in solidarity with the detainees. Police vans are heading towards Exarhia from Alexandras. 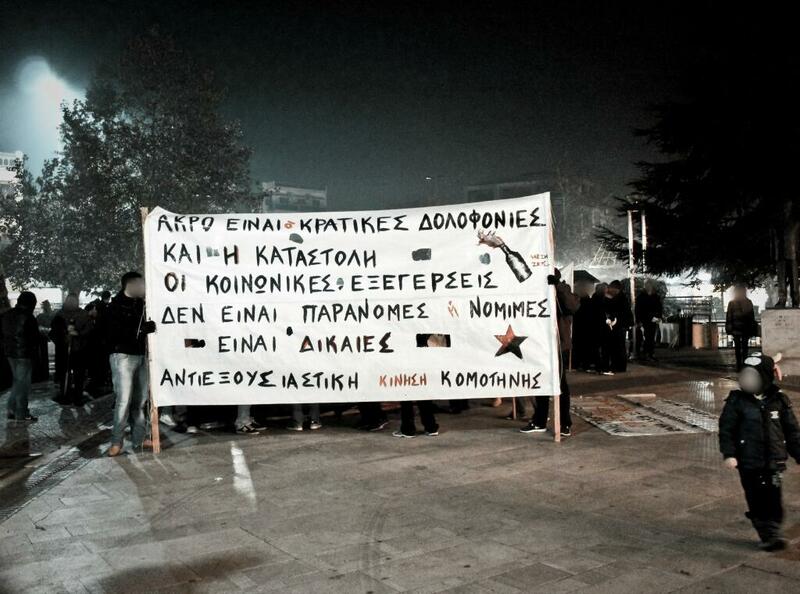 Volos [21:43] Solidarity gathering for the approximately 25 detainees outside the Magnisias Police Headquarters. 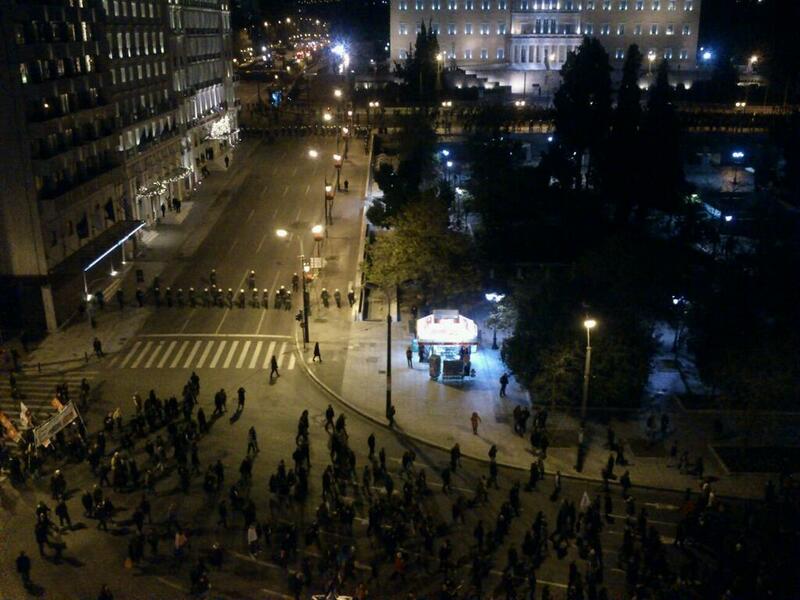 Athens [21:30] Police on motorcycles (Delta) in Tositsa and Eresou street are going upwards. Eolou street is full of cops together with undercover cops. The riot police are using the flash lights, lighting peoples’ balconies, in order to scare them off. Athens [21:26] Three detentions at the corner of Stournari st and Kanigos square by police on motorbikes. Police marching the detainees in gallop towards Patision St.
Athens [21:20] There are reports for about twenty potential arrests around the place where Grigoropoulos was murdered. A demonstrator has been detended by police on motorcycles (Delta) at the point between Mpenaki and Kallidromiou street twenty minutes ago. They where kicking him all the way to the police station. Athens [21:16] Three youngsters (aged no more than 13 years old) got away from the cops who chased them in Skoufa St.
Athens [21:13] Riot police together with police on motorbikes are getting inside the stores and detent everyone that is trapped inside. Athens [21:10] Riot police and police on motorbikes are going into the square, they are getting clashed by stones and they answer back with flash grenades. People heard that they plan to attack in Valtetsiou street. Athens [21:05] Call for Lawyers. Dozens of people are trapped inside a block of flats in Messologiou street with riot police outside. Athens [20:59] Riot police pigs are searching with flash lights outside the cafe in Tsamadou street and inside surrounding buildings. Athens [20:56] Delta team’s cops entered a mini market at Mesologgiou street in order to detain demonstrators. There is a diy medical station at Mesologgiou and Tzavella junction. Cops pushed away a person who was taking footage of the detentions. Two MAT squads at Metaxa and Mesologgiou junction. Athens [20:52] At least fifty people are going towards Mesollogiou street. Twenty police bikes are getting down from Mpenaki street right now. There are people that are trapped inside stores. 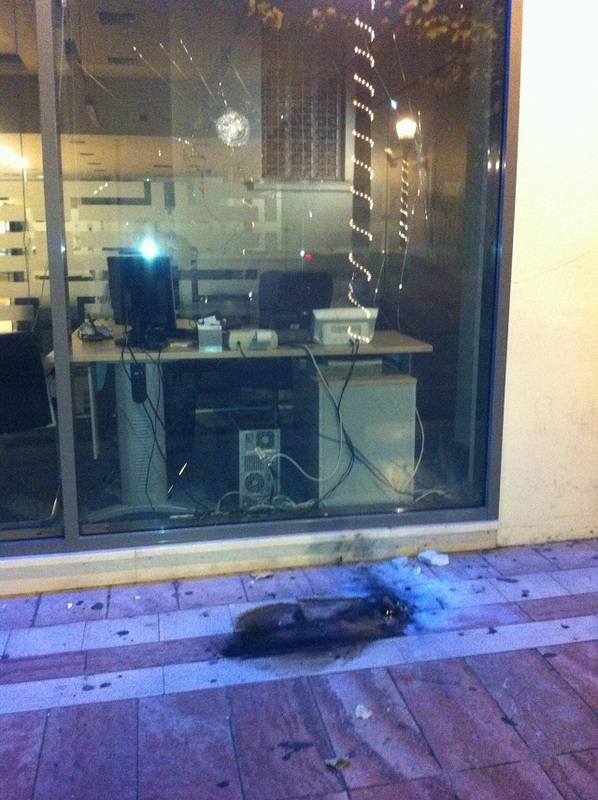 Athens [20:50] Flash grenades in Benaki str. Police on motorbikes at Exarcheia square and Sp. Trikoypi corner. 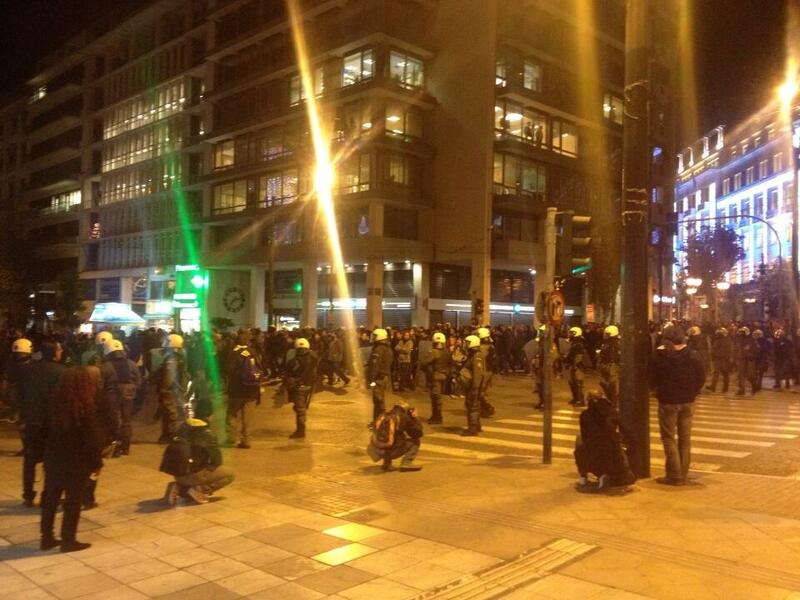 Athens [20:40] Cops have surrounded again the square from the side of Arahovis st, Kallidromiou st and the Strefi hill. Approximately fifteen to twenty undercover cops in the corner of Sp. Trikoupi and the square are talking with other police platoons. They got there from Stournari street tottaly masked. 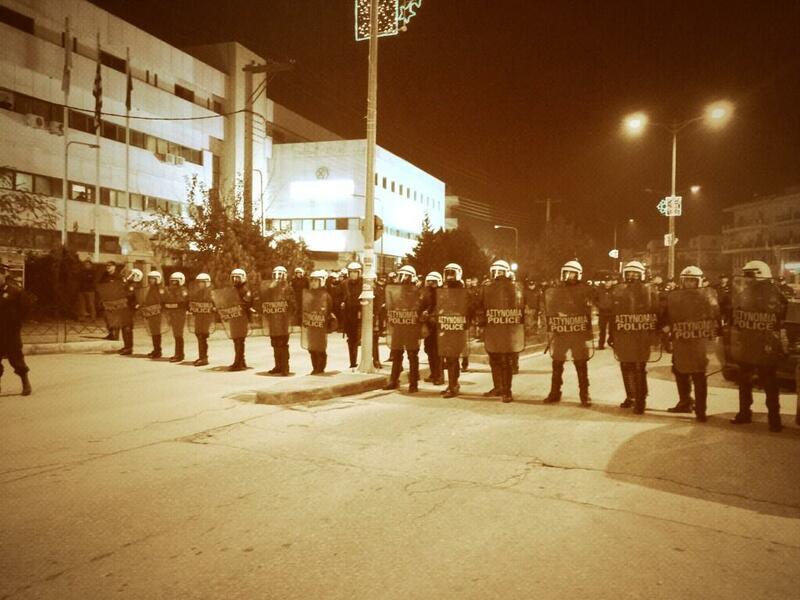 Volos [20:32] 20-25 detentions took place before the march had started, mainly youngsters. Another 10 detentions during the march. The clashes keep taking place with demonstrators within the University. Athens [20:29] Police hunting in Themistokleous and Sp.Trikoupi street. Athens [20:25] Garbage bins has been set on fire in Mpenaki street. The square is surrounded. Riot police units in Themistokleous, Tsamadou and Spyrou Trikoupi street. Police on motorbikes in Eresou and Mpenaki street. Approximately 50 people. Caution in Valtetsiou, hidden policemen. 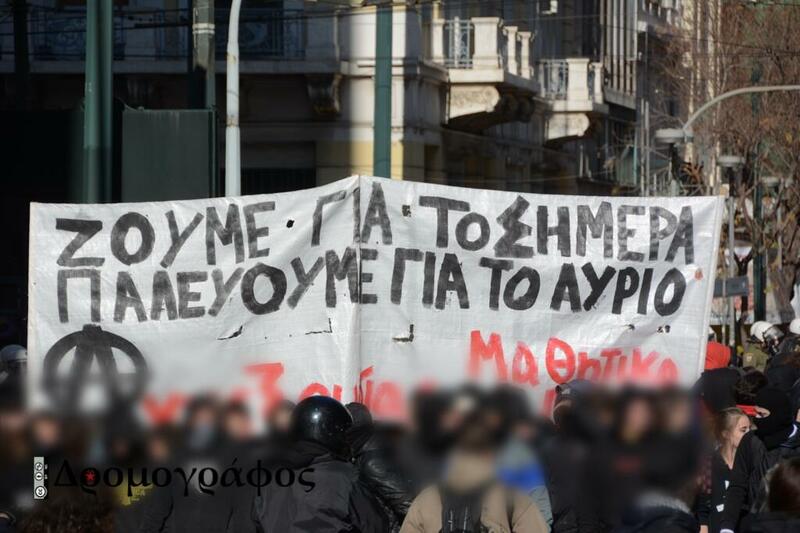 Thessaloniki [20.17] One detention took place away from the clashes by undercover cops. 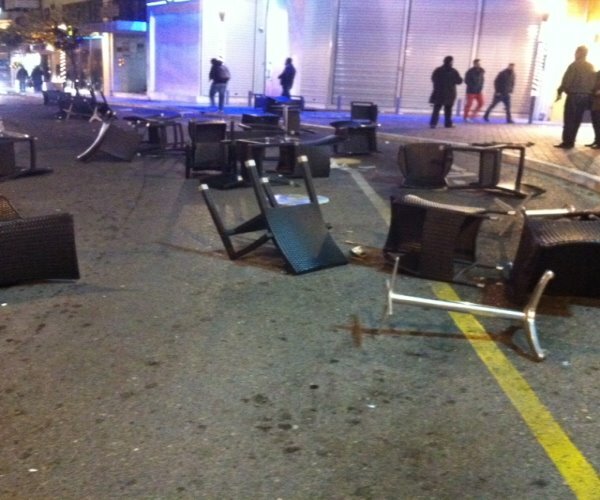 Athens [20.12] Many barricades around Exarhia square. The gathered crowd (approximately two to three thousand) is not retreating and seems like its ready to clash. 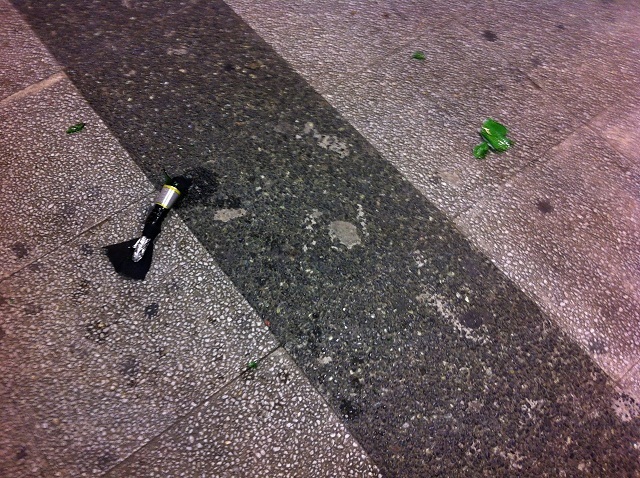 Most places in Exarcheia have no street lights on while there is extensive use of tear gas bombs. Athens [20:06] Circling move by the cops. Demonstrators fight in close distance with cops. 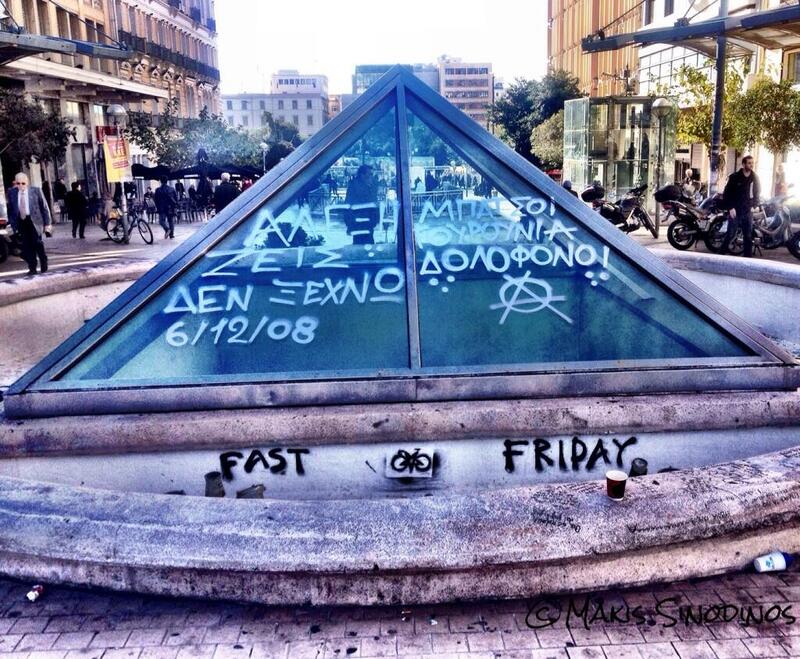 Cops took down banners that were hanged in Exarchia square. A riot control vehicle at Kallidromiou street. Delta team and MAT at Themistokleous street. 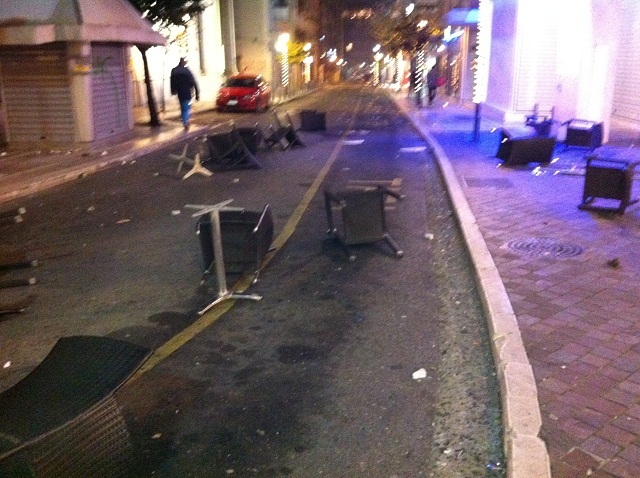 Thessaloniki [20:07] Cafe smashed after riot police rushed inside hunting for protesters. Larissa [20:06] The demonstration has ended a while ago in the post-office square with great pulse from approximately 400 people. Athens [20:00] Molotov cocktails’ attacks and clashes betweent demonstrators and cops in Exarcheia square. Frightened MAT drew back temporarily, throwing flash grenades at the same time. Barricades at Valtetsiou street. 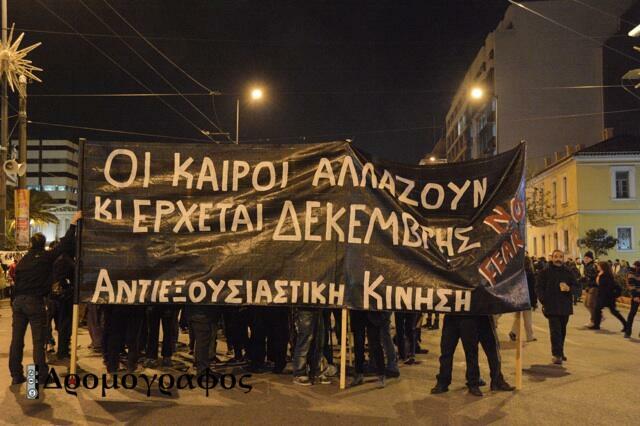 Alexandroupoli [19:54] Approximately 30 anarchists and another 30 demonstrators in leftist block marched in memory of Alexandros Grigoropoulos. 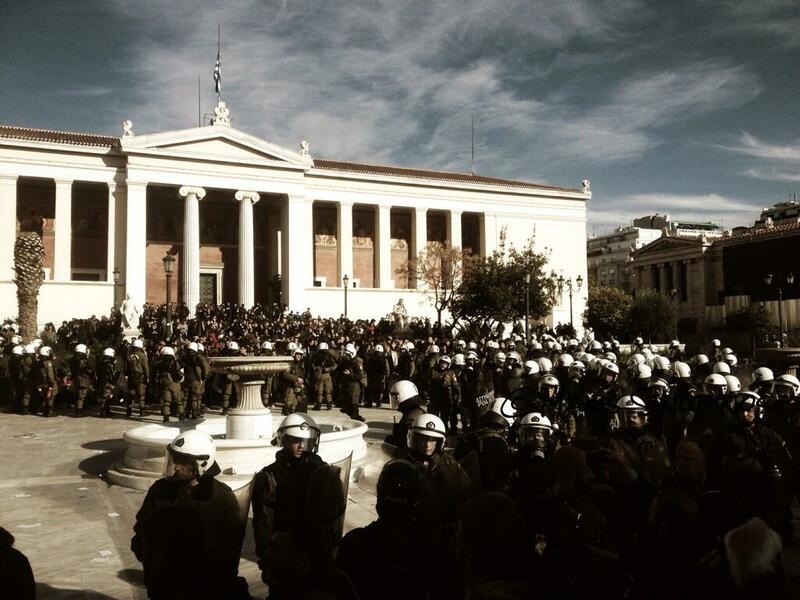 Athens [19:46] Cops now encircling protesters at Propylaia. Platoons moving down surrounding streets. Athens [19:43] Part of the demo turned suddenly right at Library building on Panepistimiou street. MAT forces were left behind. Small scale conflicts at Ipopokratous street and as a result some demonstrators head for Exarcheia and some towards Omonoia square. 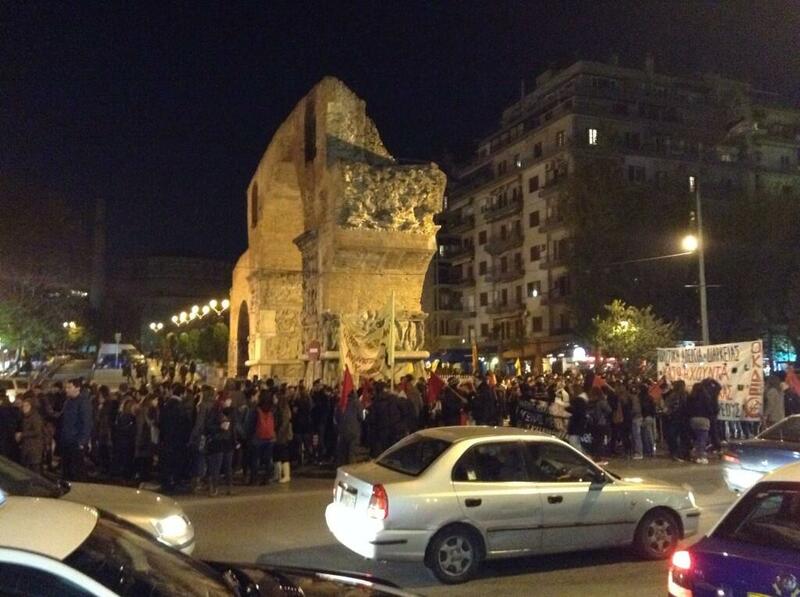 Thessaloniki [19:40] The demo is back at Kamara. Demonstrators fold their banners. Many leave but some people stay on Egnatia str. Komotini [19:40] Three banks trashed in Komitini after the demo. 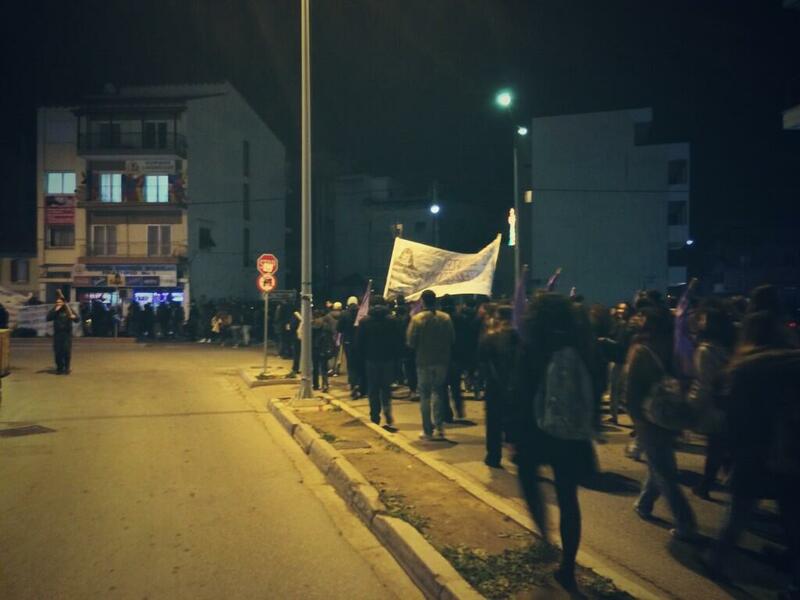 Volos [17:30] The march reached Tholos place located within the university and received attack by the police. The march seems to have disrupted for the time being. Athens [19:25] The demonstration reaches Syntagma square. Judging by the police presence on the street, the December revolt is still haunting the state. 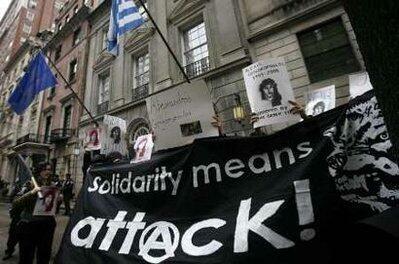 Solidarity and courage before state terrorism. Athens [19:25] Caution. Vasileos Georgiou street, which is in front of Grand Britain Hotel, is closed from both sides. Attention! Athens [18:49] The demonstration has started, people are marching through Panepistimiou, towards Syntagma sq. Riot police (MAT), police on motorbikes (Delta) are almost in every corner of Kolokotroni St. There are many reports regarding the presence of undercover cops as well. Athens [18:35] According to hellenic police, the detentions from the students’ demonstration are 55 of which 10 are arrests. It is reported that 4 police officers have been injured. 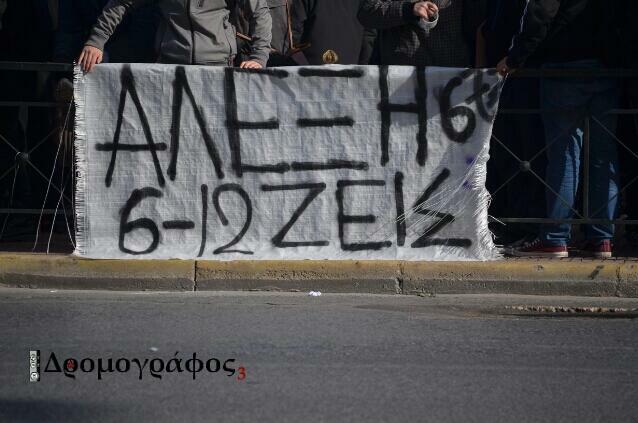 Athens [16:00] Legal support for today: 6976783658, 6944613555, 6979229075, 6946563482 and 6938675348. Athens [15:58] From phone call: proactive detentions this minute in Athens. 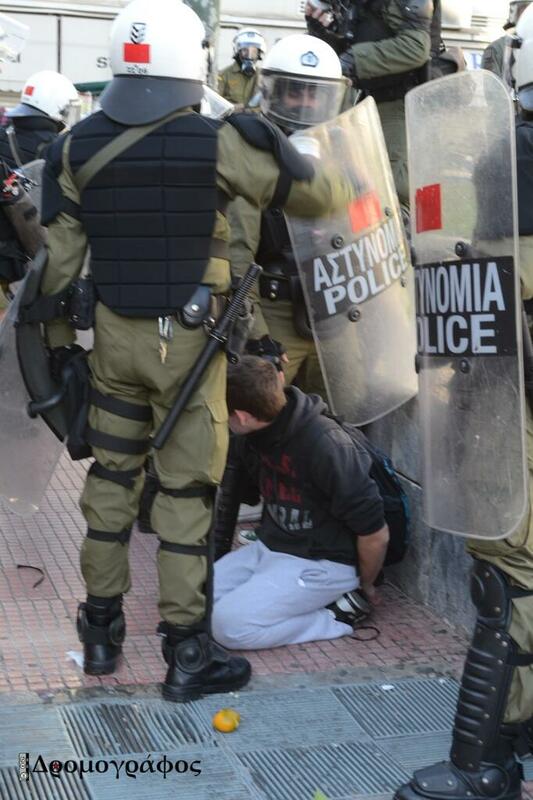 Comrade arrested on the corner of Benaki and Akadimias str. 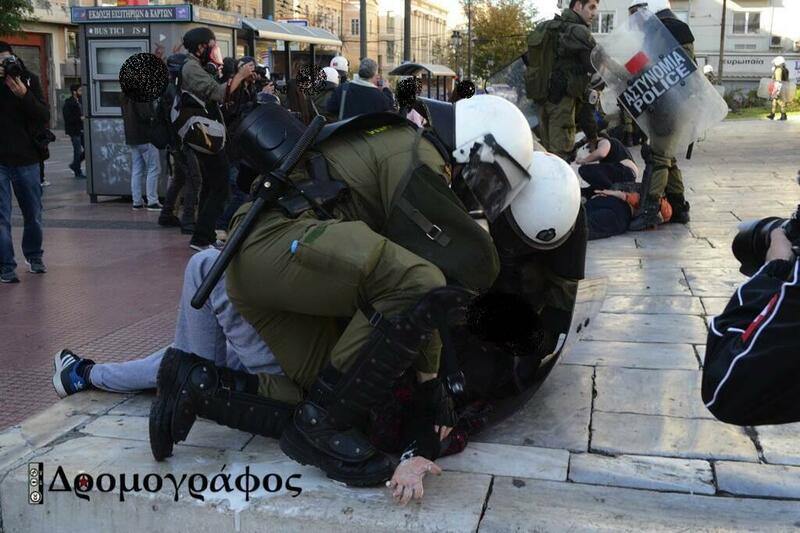 Athens [15:50] Photo gallery from the brutal detentions at Propylaia. Photograph 1, Photograph 2, Photograph 3. Athens [15:11] The squads withdrew from Propylaia. Athens [14:56] DELTA police and young undercover cops with backpacks in Benaki street. One person in charge is wearing a handset. At Zoodochou Pigis street in conjuction with Akadimias and at Panepistimiou street there are riot police squads. In every side street there are undercover cops. 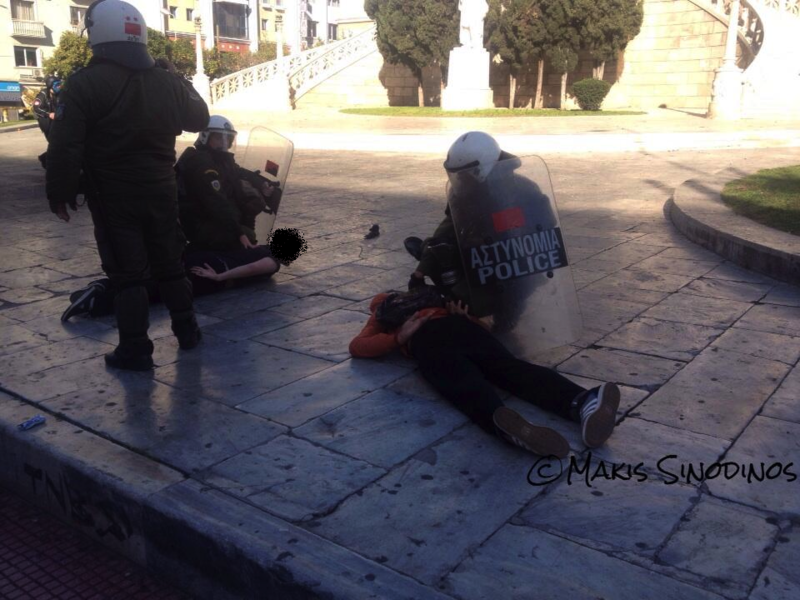 Athens [14:50] The control tactic of the trapped students has ended with no detainees. The student who previously fainted was taken by an ambulance. Athens [14:40] An ambulance has arrived at the spot and is giving first aid to students with breathing problems caused from tear gas. Athens [14:37] Suffocating use of tear gas and heavy police presence. The cops allow the students to leave one by one only after they have been searched. Photograph 1, Photograph 2, Photograph 3. 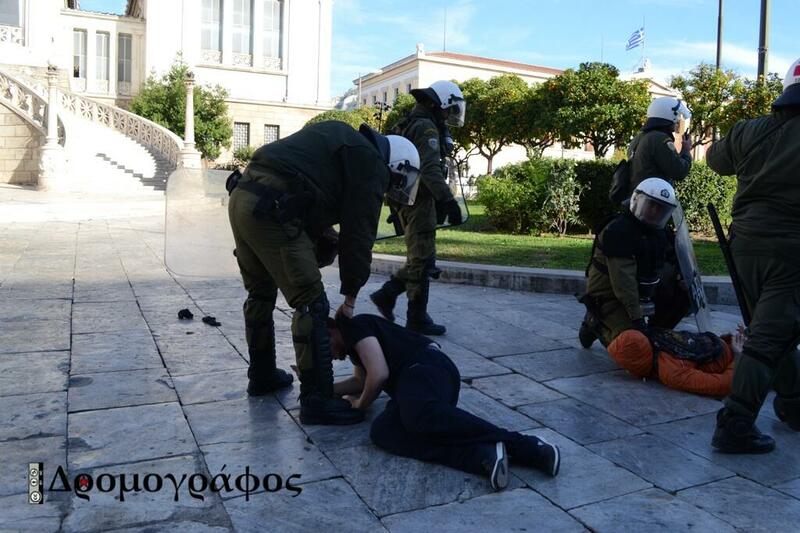 Athens [14.27] A student fainted at Propylaia and riot police prevented people to reach and give first aid. 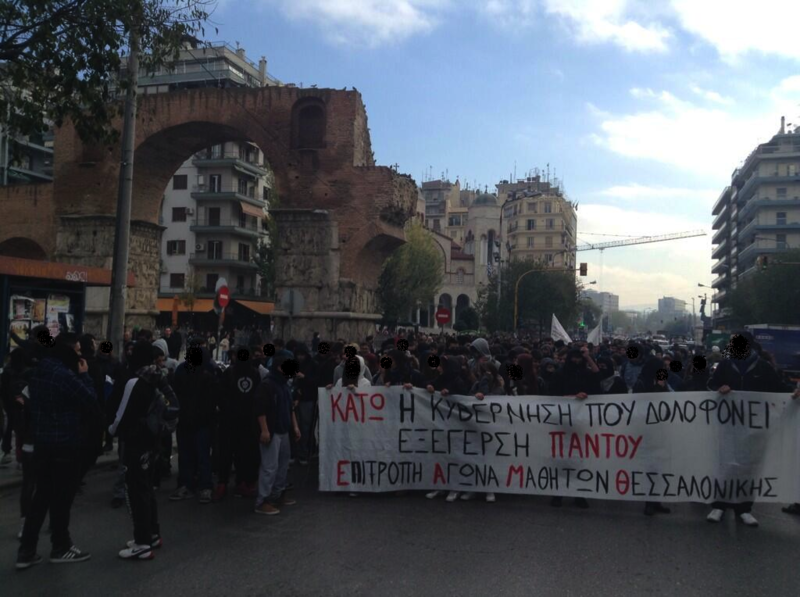 Athens [14:15] Approximately 20 young students are taken in a van from Propylaia towards the police headquarters. Whoever has lawyer’s or legal team’s telephone numbers, please inform. Athens [12:53] According to mainstream media, 30 people first attacked and beat up a traffic policeman and then they attacked TV crews, suggesting that is what caused the riot police’s presence in Panepistimiou street. 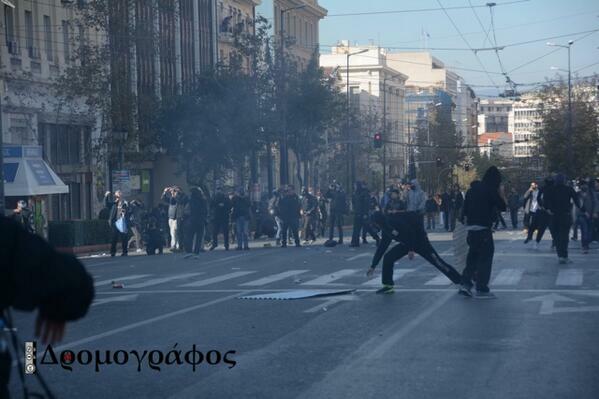 Athens [11:40] Molotov from unidentified people a few meters away from Aigaleo P.D.. No injuries occured. Athens [11:00] The municipality/ cops has removed the garbage bins from Exarhia once again in view of today’s protests. 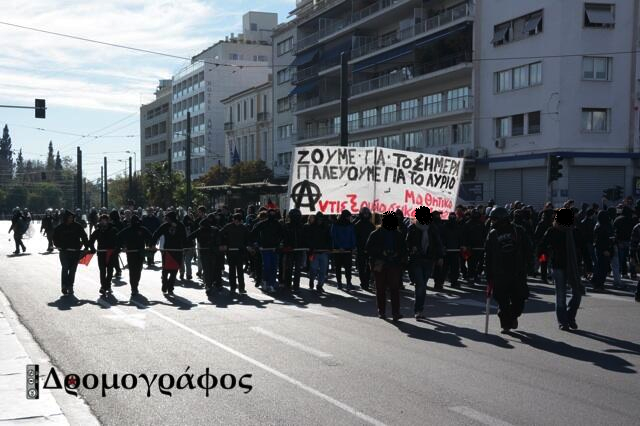 Athens [10:00] Marches are scheduled for 11:00 and 18:00 at Propylaia.